Man paddling in a kayak on river. Another great summer pastime is living on the lake. Everyone loves the lake! It can mean hours of fun with family and friends. 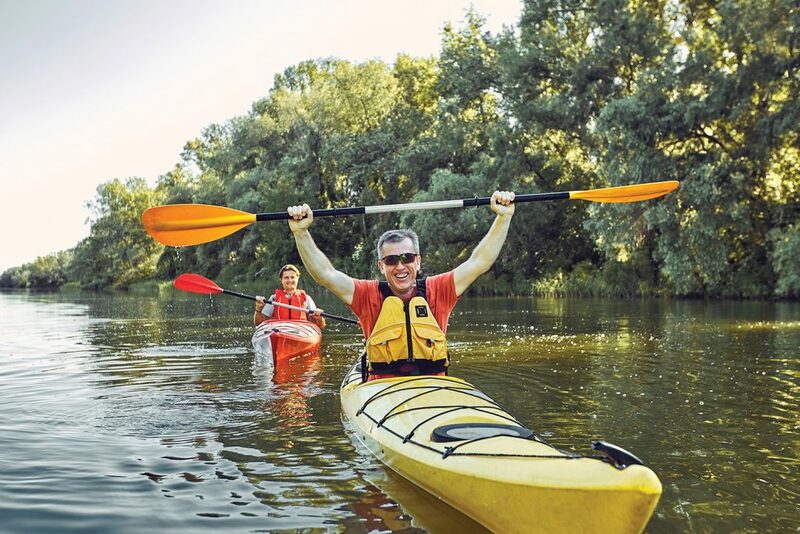 The Canoe Club offers a lifestyle that creates an inviting neighborhood with wonderful amenities. Imagine enjoying the 5,500 square foot Nantucket-inspired Lake Cottage Clubhouse overlooking the lake. The clubhouse includes a large gathering room, sunroom, catering kitchen and coffee bar. Put your new home under contract now and move in with plenty of time to enjoy the pool, enjoy a game of tennis on the lighted tennis courts, check out the lakeside wharf dock and canoe storage plus a 24-hour fitness center. Enjoy an outdoor lifestyle that is meant to love, come home to over 600 picturesque acres and 2 spectacular freshwater lakes, Menawa and Senoya. Take a peek at the community video here. The Canoe Club offers high quality, well-built homes with all of the “must haves” of today’s homebuyer. New Leaf Homes now has TWELVE new homes for the spring market, Jeff Lindsey Homes has begun FOUR new homes and Simply Southern Traditional Homes has just started ONE new home on the lake. The Canoe Club is proud to be partnered up with New Leaf Homes, Jeff Lindsey Communities and Simply Southern Traditional Homes.